Aluminum wheels are used on a variety of trucks and cars as both aftermarket upgrades and original equipment from the factory. Aluminum wheels have many benefits over steel although they are a bit more expensive. They typically range in cost from around $100 on the low side to more than $1,000 for each wheel on the high side. The actual cost will depend on the manufacturer or brand of the wheel as well as other factors including the size of the wheel and the region where you live. You can purchase aluminum wheels for your vehicle at many car dealers, tire and wheel shops and automotive parts and supply stores as well as many sites online. There are a variety of designs from which you can choose. Aluminum wheels have become the most preferred choice for those looking to add a bit more style or customization to their cars and trucks. There is such a wide variety of wheels on the market today that it often becomes difficult to choose from among the many materials and styles. Aluminum wheels however, offer many options that magnesium and steel do not offer. Of course, it is important that you take the time to research the various sizes and styles and choose the wheels that will best fit your vehicle as well as your budget. Aluminum wheels are very lightweight and tend to be very effective in dissipating heat, more effective than steel. Heat builds up as a vehicle is driven and the ability to dissipate this heat means that your wheels as well as your tires will last much longer. When you drive your car or truck, the brakes build up heat. Reducing this heat will help you to prolong the life of your wheels. Aluminum wheels resist this heat buildup much better than other materials so they tend to last much longer than steel or magnesium wheels which helps to make the additional cost worth it for many consumers. Many consumers prefer aluminum over any other type of material for a variety of reasons. Aluminum wheels are much more conveniently found in a variety of sizes. 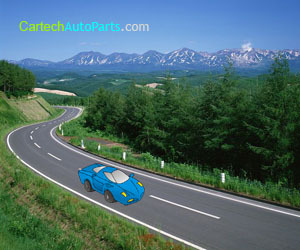 They also help to make driving your vehicle much smoother. Since they reduce the un-sprung weight of your vehicle, there is a significant reduction in the suspension and other components. Steering is typically much smoother with aluminum wheels and braking is more responsive and generally easier overall with aluminum than with steel. It is important to understand that aluminum wheels must be cared for carefully. Aluminum is typically softer and therefore damages easier. If you hit a hole in the road while going at an excessive speed or even a speed bump in a parking lot, you could warp or otherwise damage the aluminum wheel. You will need to drive carefully to prevent damage. You should also note that aluminum wheels must be kept clean. Regularly washing the wheels and removing any built up dirt or grim is important. This keeps them in the best possible shape and helps to prevent signs of wear. If you do not clean them regularly you could cause damage to them. Grime and dirt building up on aluminum wheels could cause them to rust which will in turn cause them to need replaced. Remember that aluminum wheels are not considered to be cheap by any means. If you do not take proper care of them you will end up spending much more than you had anticipated by replacing them entirely too often. Regularly washing and cleaning them carefully, at least once each week or so should do the job. If you take good care of your aluminum wheels, drive carefully and keep them clean, there is no reason why they should not last for years.